This article is reprinted with permission from The Ergonomics Report™ Archives, where it originally appeared on November 1, 2011. Low back pain remains the number one musculoskeletal disorder among nurses, and it is widely attributed to manual patient handling activities that routinely expose nurses to heavy lifting, awkward postures, and high push/pull forces. In response, a number of ergonomic interventions have been developed to reduce the occurrence of back pain in patient handling activities. The efficacy of interventions such as lifting devices, adjustable beds, slip sheets, etc. has been demonstrated in several studies cited in this article, but implementing a safe patient handling process that uses such ergonomic equipment interventions has proven difficult for some, and previous studies have identified individual factors such as lack of perceived need and lack of knowledge, and organizational factors such as lack of time, lack of a policy of mandatory lift usage and employee-to-ergonomic device ratio, as barriers to success. Netherlands based researchers E. Koppelaar, J.J. Knibbe, H.S. Miedema and A. Burdorf devised this study to further evaluate both individual and organizational factors that influence the use of safe patient handling equipment during patient handling activities. The researches invited a number of hospitals and nursing homes to participate in the study. The sample was limited to facilities in the Netherlands with a structured patient handling program and a staff “ergocoach”. A total of 19 hospitals and 19 nursing homes (46% and 45% of invitees, respectively) accepted the offer. All 19 hospitals were considered general facilities and included patients staying at least a couple of days. Of the 19 nursing homes, 10 were long-term care facilities serving patients with age-related problems. The other 9 nursing homes provided residential care and rehabilitation for patients with disease, disorders, or age related problems that didn’t require hospitalization. The study took place from 2007 through 2009. Trained observers followed nursing staff as they performed common patient handling activities including transfers to and from beds, repositioning in bed, showering, and dressing with compression stockings. The observers recorded a total of 670 patient handling activities and compared the observed practices to the national practice guidelines developed by the health care sector. The observers also interviewed the nurses and the clinical “ergocoaches” who were responsible for the program. Self-administered questionnaires were sent to clinical management. Ergonomic devices were actually used only 68% of times they were required in nursing homes and 59% in hospitals. Lifting device use during transfer of a patient was strongly associated with motivation among nurses to use lifting devices. Lifting device use was strongly associated with having experienced back complaints in the past 12 months. Lifting device use was strongly associated with the availability of patient specific protocols with strict guidelines for ergonomic device use. For patient handling activities other than transfers, none of the determinants had any association with required ergonomic device use. Other factors, not assessed in this study, may have had an influence. With regard to the use of sliding sheets, other studies have concluded that the worker’s personal technique and movement strategy is a critical determinant of back load in the use of these devices. The lack of maneuvering space may also be a barrier to lifting device use, and might also be a barrier to shower chair use during personal care. The authors caution that the results and actual use of ergonomic interventions may be lower than reported here if facilities don’t have practice requirements to use the device or if they don’t have ergocoaches or others responsible for supporting a program. This study demonstrates that, like all ergonomic interventions, there are a number of individual and organizational factors that may create barriers to equipment use and overall effectiveness. 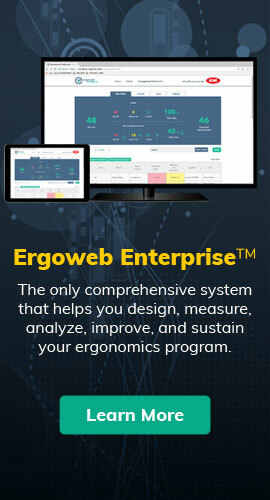 While ergonomics solutions often involve the use of specialized equipment, that equipment alone will not spell success. Instead, such equipment must be integrated into the work system so that its use becomes normal and natural. Requiring equipment use through procedural rules alone is not effective in many cases where a thorough process analysis and design has not been conducted. In order for such rules to be effective, physical, spatial, emotional and organizational barriers must be addressed. Management must understand and support the process, and employees must be trained, motivated and held accountable to follow protocols. If barriers remain after such an integrated approach, then the equipment and process must be re-evaluated and improved (in continuous improvement systems such as Lean, this would be referred to as a PDCA — Plan, Do, Check, Act). Motivation to use lifting devices is enhanced by making sure that enough lifting devices are available in proportion to patients on a ward, by providing easily available lifting devices, and by ensuring good maintenance. Not surprisingly, nurses that have pre-existing back pain or injury are more likely to use assitive equipment and protective procedures. Non-symptomatic nurses must also be motivated to protect themselves from injury, so whatever equipment and procedures are implemented must also influence currently healthy workers. A demonstrated commitment by management to support safe patient handling methods has a positive influence on the availability of patient specific protocols with strict guidelines for ergonomic device use. This was demonstrated in this study through policy, providing adequate numbers of lifts, maintenance of lifts etc. Training in the use of such devices as sliding sheets should help nurses to actually use the devices and follow procedures. The differences between the use of equipment in hospitals vs. nursing homes (43% vs 72%) are not necessarily due to the nature of the different facilities. Instead, individual and organisational determinants within specific organisations are more important than differences between healthcare settings.